Citizens Advice Norfolk are now here in the DIAL office on a Tuesday 12-3.30pm. Their representative will be giving support for new claims, from opening accounts to receiving the first full payment. So if you are in need of making a Universal Credit claim please come along for some help and advice. East Coast College tutor Catherine was here Tuesday 2nd April 1.30 - 3pm for the information day on English classes for those of you wishing to improve your reading and writing. Come along and join in or call the number above for more information 01493 419293 or email Catherine at c.gray@eastcoast.ac.uk. 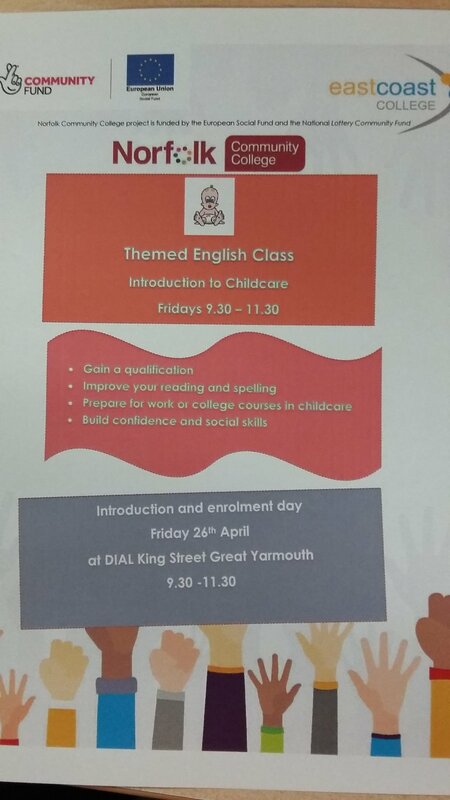 Catherine is also here for an information day on 26th April regarding a Themed English class aimed at building confidence and social skills around childcare with the start date for the course on 3rd May. Again anyone wishing to join please come along to see what its all about. 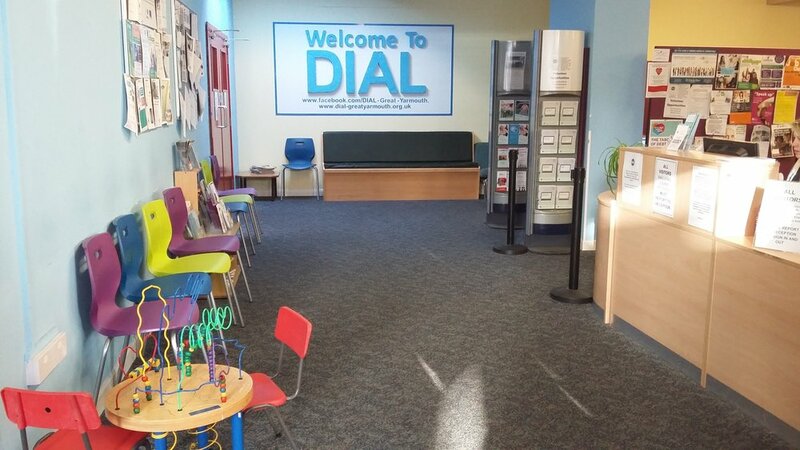 Great Yarmouth & Waveney MIND have made themselves at home here in the DIAL building and are here to provide support around mental health issues. For all enquiries please call MIND on 01493 842129. The Social Blooms project through The Green Light Trust has sadly come to an end and will be greatly missed by all concerned especially the Volunteers who found this most rewarding and self confidence building. Volunteering Opportunities are always available. If you wish to be part of our friendly volunteering team please call Jenny for more information on 01493 856900. Norwich Credit Union are here Mondays 1-4pm and extra hour has been added due to demand, and Fridays 10-12.30pm providing advice to anyone having trouble with opening a Bank account or just wanting to save for a rainy day or to simply pay the bills. Our Craft Club is held on a Thursday 10-3.30pm for those of you who enjoy crafts and being creative. Just come along to see what its all about and maybe join in and meet new people. Below is just some of the things that have been created within the Craft Club. Route 9-5 cafe is still ongoing for the moment and being held at DIAL alternate Thursdays 10am-12pm. For those who have been out of work for some time and would like help getting back into employment or volunteering. Anyone wishing to join in please come along to see what its all about.